We had quite a bit of time in Helsinki and managed to explore many of the cities attractions as well as some hidden gems. The Hietaniemi Cemetery is definitely on of those gems, and was well worth the visit. There were many of these old iron crosses dotted across the graveyard, and I’m not sure who ‘Albert Ludvig Crashoff’ was, bet lets hope he enjoyed his 42 years. All photos in the ‘Image of The Week’ series are protected under the ‘Creative Commons’ licence as detailed below. You are free to copy and distribute this image as you wish, as long as the image itself is used for non commercial use, remains unaltered, and with a link back to this site. I am by no means a professional photographer, but I believe some of my images are worthy of sale. Traveling the world is an expensive hobby, so If you would like to purchase this image for commercial purposes, then please click the tab above, and you will be presented with a series of options through the ‘FotoMoto’ service. The image displayed above is a reduced and highly compressed JPEG. All licensed images made available for download, are supplied in full high resolution TIFF format. All prints are also created from these full resolution images, without watermarks. DigiDrift – Images by Jason Webb is licensed under a Creative Commons Attribution-NonCommercial-NoDerivs 3.0 Unported License. An image taken in China’s busy Nanjing Road shopping mall in the heart of Shanghai. 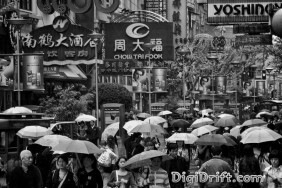 As soon as the rain started to fall, umbrellas would be sold on every street corner, by those eager to make a quick buck (or Yuan). Copyright © 2011 DigiDrift.com. All rights reserved.